Well... today is Friday! We have a busy day planned... going out for breakfast (they are anxiously waiting for me to finish this blog) then to the grocery.... you know...all those fun things. How stinkin' cute is this? They have a yummy candle sitting in greenery! Can't you just smell this burning? Now me... I'm all for the candles that smell like food! Yes... FOOD! You know... cinnamon buns, grandma's sugar cookies, gingerbread.... OMG!!! I remember this lady that came into the store... she was in her 70's - as cute as a button! She loved our candles...especially the "food" scented ones. She said to me "You know, these candles smell so good, make me feel so hungry... I could just eat them... but them I'd have to go around all day with a waxy upper lip!" Isn't that cute? I sure laughed at her... however, I can totally relate to her logic! And...here we have another favorite - NESTS!! They are so popular...nests and birds. 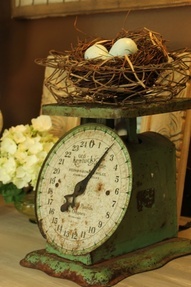 I love how they have this little one with the eggs sitting on their scale. Too sweet! This is the best! 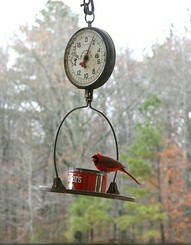 I love these HUGE ones... and how great is this in the back yard as a bird feeder! Pretty cool how the cardinal blends right in with the red can isn't it? Isn't nature just the absolute BEST?!!!! This little vignette is adorable. 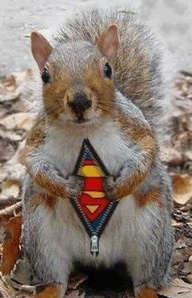 It reminds me of my friend Marti! 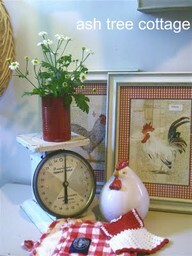 She loves this look and it's so darn cute in her adorable house in Kentucky! MISS YOU MARTI!!! I think it's about time for a road trip to go see her!! Now...this one is for my friend Paula! We talked about daisies when I was at her house. 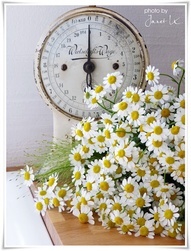 She loves them and hopes someday that one of her daughters chooses DAISIES for the wedding flowers! They are so "fresh, crisp, and fun" - don't you think? Let's now talk "packaging"! I think it's so amazing how clever people are with the way they wrap gifts. The great part... it doesn't have to be expensive! 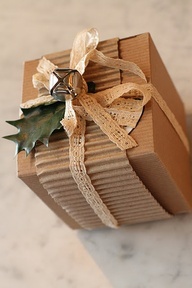 Then... we have a simple cardboard box wrapped with corrugated cardboard, simple lace ribbon with a jingle bell and a holly leaf (from your yard). Looks very organic and I love it! 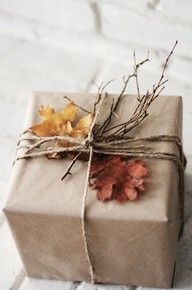 Then... here's a great fall wrapping! 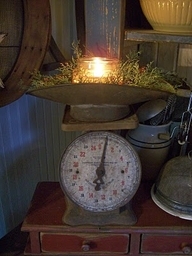 Brown paper, jute twine, some twigs and a few fall leaves (also from your yard). Nature here we come! Doesn't this just scream FALL YA'LL??? 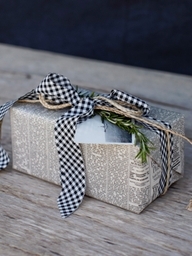 Let's all challenge ourselves to be "thrifty, and clever" when it comes to wrapping! 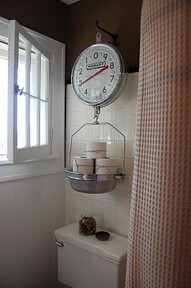 I even love the packages you see where they tie up their boxes with old clothing patterns - tied with a tape measure! Now how wonderful would that be to receive? Well, that's it for the day... the "home front" is screaming for breakfast. PLUS... I will be "out of pocket" until Thursday morning. Vicky and I are going on a little trip to Vermont and we will not have access to the Internet! Boo Hoo!.. Everyone keep sewing... keep crafting... and I'll be sure and chat with you first thing on Thursday morning! !